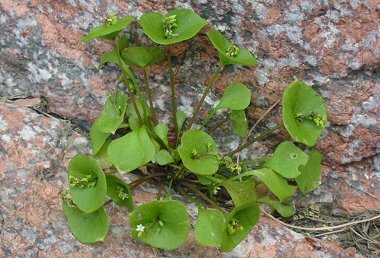 Miner's Lettuce is a member of the Portulaca Family. It typically grows in shady moist areas at altitudes between 2,500 and 7,500 feet. Leaves at the ends of the stalks are green and circular (to 2" in diameter) with a small, white flower growing from the center. Other leaves of the plant are more oblong in shape. Flowers bloom between February and May. 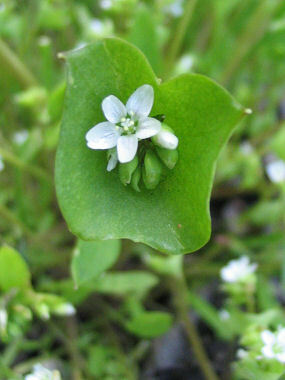 Miner's Lettuce was used by pioneers and Native Americans as an herb and for salads.